After every mass shooting we hear calls for “good guys with guns” echo from the NRA and gun nuts. But in just two weeks we have had two situations where this happened and the outcome isn’t what the NRA and their ilk was hoping for. First up is a shooting in a Chicago bar a couple of weeks ago. What could have turned into another mass shooting, which sadly doesn’t even register on the national outrage meter anymore, was thwarted by an armed security guard. But the outcome is not what you expect. 26 year old Jemel Roberson was working security in the bar. He was able to subdue the gunman and held him to the ground, knee in back and gun to head. Once Chicago police arrive they opened fire, killed Roberson and leaving the actual criminal alive. Then Thursday night, as Thanksgiving dinner was being digested and many were in food coma, an all to familiar story emerged. At a mall in Alabama an altercation occurred, resulting in 2 people shot and one dead. The one that was killed was Emantic Fitzgerald Bradford Jr., who police identified as the gunman. But as it turns out that might not be the case, and instead Bradford, a solider in the Army, may have just been running from the scene. And what do these two stories have in common? Well both men, shot dead by police, were black. I can’t help but wonder what narrative we would be hearing today if these two incidents involved white men. I bet you that the NRA would be out in full force calling for blood. I mean they would have just been “exercising their God given 2nd amendment right”. So has the NRA said anything about these horrible incidents? Not a peep. And do I blame the police for what happened? Not at all. 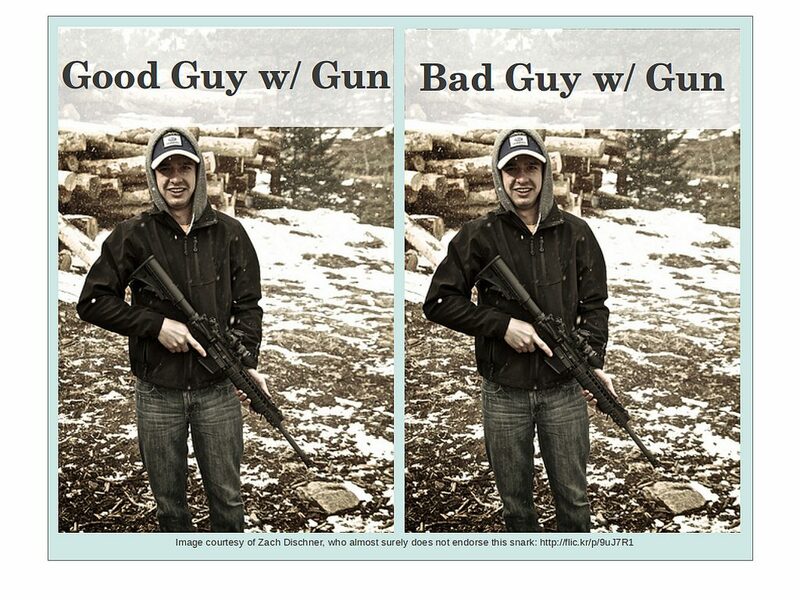 As the picture above points out, you have no idea who is the good guy with the gun and who isn’t. You’re in an adrenaline filled situation and can’t sort all that out. So until we have a common sense discussion about guns in our society, these stories will continue to come out. People doing what the NRA preaches will continue to get killed, and the NRA will remain silent, at least until it’s a white guy that gets killed.